This advertisement ran in comics cover dated March 1985. You can see the title promoted was UNIVERSE: CRISIS ON INFINITE EARTHS. As originally planned, it was to be a 10 issue series entitled HISTORY OF THE DC UNIVERSE. It was quickly expanded to 12 issues and the name changed to what you see in the advertisement above. 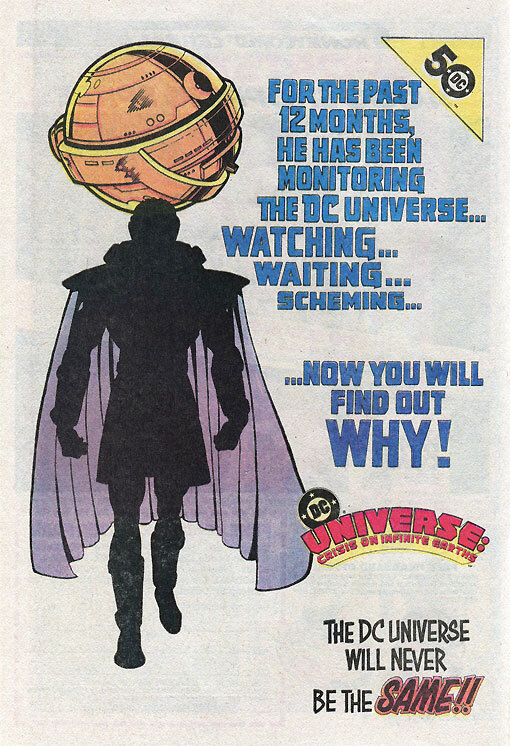 Finally, the word UNIVERSE was dropped before #1 hit the stands a month after this ad ran. Many modern-day fans of CRISIS don’t realize that the Monitor appeared in several DC comics the year leading up to CRISIS. He was initially a faceless character who supplied villains with equipment in order to test heroes for the Crisis ahead. As a result, the character was seen to be a villain himself and his real reasons were not revealed to the reader until CRISIS #1. DC did a really good job building anticipation for CRISIS. I remember reading about the Monitor in Firestorm and Blue Devil wondering just who this guy was. It was neat to run across this advertisement while re-reading some old comics. I’d just barely started to read DC comics around this time, and while I remembered the monitor mystery, I’d forgotten the longer title. The one they went with was definitely better. as a giant “CRISIS” leaps out at you on the cover in a ways that “UNIVERSE” doesn’t. I never read it, though the hype did and does compel me to WANT to read it. Though the endless sequels could change my mind. I did read Secret Wars, though, which I figured was better, or at least more lucid, though it did not feature me in it. I also read Secret Wars II, which was… different. I liked how it showcased every Marvel super-hero ever (except Man-Thing and… Howard the Duck), but still… he kills the New Mutants, sends Dazzler to kill Galactus (wow… really?? don’t rely on my memory, I’m just a skull), but DOESN’T have time to distract Captain America (previously his most lethal foe!!) by sending The Red Skull to do the job? And I don’t know, and probably don’t want to know, what Marvel’s ‘Secret War’ is. Holy bat-droppings, Bat-man! Sounds just like The Monitor in ‘Crisis on Infinite Earths’!!! It was a great time in comics, and the build-up to the event itself was great. And it really helped clean up the disaster that was the DC multiverse at the time. In hindsight, it’s bittersweet to look back at Crisis as the truly exciting event that it was and realize that it spawned 1000 monsters – can anyone remember a time when either Marvel or DC wasn’t in the midst of either an event, a countdown to an event, or an aftermath from an event? I’m pretty sure that for Marvel it’s been nonstop ever since “Avengers Disassembled”; in DC’s case, they have been in nonstop Crisis mode since the “Countdown to Infinite Crisis” began. 1) I have no idea how Flash fans are going to react to this, since Barry Allen is such a polarizing character right now. I read a recent interview with Cary Bates – I think it was in Back Issue – in which he sort of shot down the whole “Flash dying to symbolize the end of the Silver Age” theory to which so many of us (including me) subscribed. Instead, he said that Carmine Infantino found out about Crisis and jumped at the opportunity to put Barry on the “to kill” list. This was because Flash Vol. 1 sales were slumping, and the current storyline was, in the mind of both Infantino and a plurality of readers, too long and dragged out. Ironically, it was exactly the kind of storytelling that dominates comics today. In any case, Wolfman turned it into a symbolic event, but the original decision (according to Bates) came from Editorial. 2) After Crisis, DC wasted no time in experimenting with other events. one of the first post-Crisis events was Millennium, a storyline I recently reread when I was supposed to be organizing my short boxes. Is it me, or does Millennium bear a striking resemblance to Marvel’s Secret Invasion? I would have to go back and re-read Millennium to look for the comparison to Secret Invasion. As my memory goes, Millennium bears a striking resemblance to a big steaming pile of crap. When we miss out on something great (Crisis), the ‘next big thing’ is the closest thing to reliving what we never lived. For DC, Millennium was the next big thing after Crisis. And, it looked like a big steaming pile of crap. So, I passed on it. Oh, it was a steaming pile of crap, to be sure. I didn’t mean to imply otherwise. But you’d be surprised how easy it is to convince yourself of the importance of “researching” old comics, when you’re tasked with organizing decade-old boxes covered with dust and cat pee stains. I’m just saying that in terms of – I hate to credit Millennium with this word – “plot” – there are many similarities to SI. Abductions and replacements of trusted allies, alien cults with ancient grudges and prophecies, all that stuff.